Great news from Dbeere Yachts as Debbie Beere closes on her listing for sale, the 38.63 metre motor yacht Larissa, with Rytis Babravicius at Camper & Nicholsons representing the buyer. Larissa was built by Sunseeker International in GRP to a design by Don Shead as a Predator 130 model and delivered in 2010 with upgrades in 2012. Formerly known as Le Volpi, she is MCA compliant and features an impressive interior in black satin finished American walnut with ivory coloured highlights. A large flybridge and an extensive aft deck offer ample space for al fresco entertaining and dining. An attractive feature is a full height bulwark balcony fitted with manual stanchions on the starboard side of the main deck saloon. Larissa sleeps 12 guests in a master suite, two double staterooms and two twin cabins, each with a Pullman berth and all staterooms have full en suite bathroom facilities. 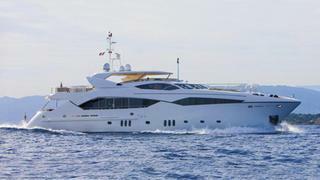 Twin 3,460hp MTU engines give Larissa a top speed of 26 knots and she was asking $11,950,000.